If you want to keep that new smile after orthodontic treatment, you’ll need to wear a retainer for awhile. Teeth have a tendency to “rebound” to their old positions and a retainer prevents that from happening. Most people are familiar with the standard removable retainer. 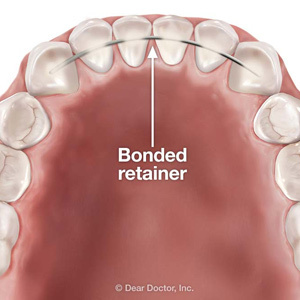 But there’s another option: a bonded retainer. While performing the same function as a removable one, the bonded retainer differs in one important aspect—it’s fixed in place and can’t be removed except by a dentist. It’s especially useful for certain bite repairs like the closure of the gap between the front teeth. If you’re thinking this retainer sounds a lot like the braces just removed, it’s not. The main part of a bonded retainer is a thin metal wire that we bond with a dental composite material across the back of the affected teeth. While you can definitely feel it with your tongue it can’t be seen by others, which is an advantage over many removable retainers. The fixed nature of bonded retainers also creates a couple of advantages, especially for younger patients. There’s no compliance issue as with removable retainers—the patient doesn’t have the option of taking it out. That also means it can’t be lost, a frequent and costly occurrence with the removable variety. But a bonded retainer does have some drawbacks. For one, the wire and composite material make it more difficult to floss. There’s also a possibility of breakage from high biting forces, which if that should occur must be immediately repaired to avoid the teeth rebounding. But while removable retainers have their downsides, it’s much easier with them to keep the teeth clean of plaque—you simply take the appliance out to brush and floss. With your dentist’s help you can weigh the pros and cons of both types of retainers and decide which is best for you or your child. Whichever one you choose, wearing a retainer will help protect that hard-earned smile for years to come.